Somaliland Representative to the European Union and UNPO Member Mohamoud Abdi Daar sheds a light on the drastic social and financial impact of desertification in Somaliland. Desertification, both a natural and man-made phenomenon, has been disrupting traditional social institutions and having a severe impact on the livelihoods of the people of Somaliland, forcing many to move to urban areas to make a living. Primary causes of desertification in Somaliland include deforestation, overgrazing, mismanagement of land and soil erosion, compounded by the 3-year drought that has been ravaging the region. Powerful images of the impact of the drought are ever present in Somaliland, featuring children suffering from undernutrition and dead livestock. Somaliland representatives and diaspora organisations urge the international community to recognize this emergency and provide Somaliland with urgent humanitarian aid. Alongside this a long-term strategy is needed to mitigate the impact of desertification, which has been seriously inhibiting Somaliland’s social and economic progress. Below is an article by Mohamoud Abdi Daar, Representative of Somaliland to the EU. Desertification which is mainly degradation and destruction of the ecology system encroaches in dry and semi-dry lands in many parts in Africa especially in the Sahel and the Horn of Africa regions, including Somaliland. Viewed both as a natural phenomenon and man-made phenomenon, it poses severe threats to populations living in fragile environments; disrupting their traditional social institutions and ruining their livelihoods and economic activities, forcing many of their productive members to migrate to major cities. The primary causes of desertification in Somaliland include, among other things, deforestation, over-grazing and mismanagement of land and the environment as well as soil erosion, all of which have damaging effects on farmland and rangeland. Drought, considered as a cyclical phenomenon generally refers to rains failing for a long period of time which accelerates desertification and drastic reduction of water. Drought, is more compounded nowadays, by global climate change. In Somaliland, a 3-year drought continues to ravage the country which began in the western part at the beginning and now widely affects the eastern part of the country. 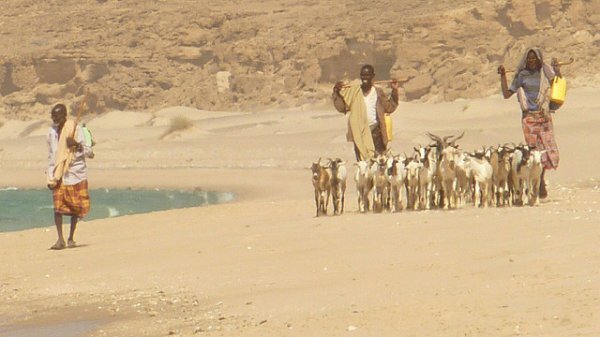 The powerful images of the drought are well-projected by the Somaliland TV; which shows broken and destitute families pulling their malnutritioned children along, livestock carcasses scattered in over large and dry expanses of land as well as tens of thousands of displaced families and their livestock being transferred from one region to the other in the country. Because of its duration and intensity, the drought has had severe devastating effects on the country's economy; reducing livestock, the mainstay of the economy, agricultural production and affecting health and general wellbeing of the population. Although official statistics are not yet available, it is estimated that over 2 million livestock were lost in the current drought. More than 60 % of the populations depend on livestock for their livelihood. As the most important export commodity to the Gulf countries, livestock makes up, almost 30 % of Somaliland's Gross National Product (GNP), (Somaliland in Figures, Ministry of Planning, Hargeisa, 2015). Unfortunately, for unknown reasons, Saudi Arabia has hastily decided to impose a ban on livestock imports from Somaliland. For their part, the president of Somaliland, Ahmed M. Mohamoud Silanyo, and his government have been doing a great deal of work to alleviate the suffering of the people especially in those regions severely affected by the drought, which he personally has visited last November. By calling on national solidarity and self-reliance, the President, encourages the business and civil society communities including women and youth associations to actively participate, together with the National and Sub-Regional Drought Committees, in the drought relief effort. Outside the country, Somaliland's representatives and Diaspora organizations play a valuable role in mobilizing funds and raising awareness of the drought situation among the international community. However, considering the scale of the drought and its adverse effects, Somaliland strongly appeals to the UN agencies, the World Bank, the European Union (EU), to governments, and international NGOs for urgent humanitarian aid. Following this emergency, it might be well also for Somaliland, to plan a determined long-term strategy to find solution to desertification or how to mitigate its future effects, drawing on experiences where it has been successful in other countries. Such plan of action could be integrated in the national development plan of the country. All concerned government ministries would participate in its implementation, together with the Ministry of Environment and Rural Development led by Mrs. Shukre Haji Bandere. The strategy would focus on vigorous range management, soil and water conservation including tree-planting, limiting over-grazing and preventing deforestation. Improving water availability would also require additional construction of surface dams during rainy seasons and deep wells. In its history and at present, Somaliland has always been an important food-producing area. To keep it productive and self-sufficient in food, top priority should be given to livestock and agricultural production as well as fisheries and marine resource production in the country's development plan goals. This should also include adequate rural infrastructure development projects. For future emergencies, it's well to think, in addition, of setting-up reserve grain stocks of sorghum and millet. International cooperation has also an important role to play in the implementation of these anti-desertification programs, in terms of financial, material and human resources. As is known, Somaliland, due to its present non-recognized status, cannot borrow or access development funds from the above-mentioned organizations and institutions, a situation that unfortunately, holds back its social and economic progress.